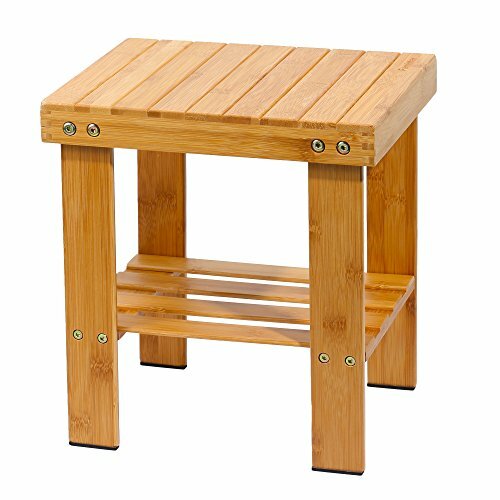 Famistar Bamboo Step Stool For Kids Children Adult,Anti-Slip Lightweight Chairs Seat With Storage Shelf/Foot Pads,Multfunctional for bathroom,living room,bedroom,laundry room or garden etc-Medium Size by Famistar at Indsight. MPN: FS-05078413. Hurry! Limited time offer. Offer valid only while supplies last. 【Multi-purpose】Ideal height to rest foot on or to sit on to take off shoes; Works as storage stand, kids step stool or adult stool for fishing, clothes washing and more. 【Mold-resistant Finish】Outstanding varnish coatings free from mold, mildew, fungi, and termites; Lovely stool exhibits delicate workmanship. 【Heavy Duty】Nicely made stool with thick and stiff 100% mountain bamboos as raw material. Dimension: 12.2 inches* 9.4 inches* 13.3 inches (L x W X H). 【Non-slippery Pad】Non-skid cushions at the bottom of the stool feet effectively protect your floor from scratches. 【Nickle-plated Screws】Extra thick nickle plated screws are corrosion-resistant and meantime more sturdy; Stainless steel screws enable repeated assembly and disassembly of the stool. If you have any questions about this product by Famistar, contact us by completing and submitting the form below. If you are looking for a specif part number, please include it with your message.